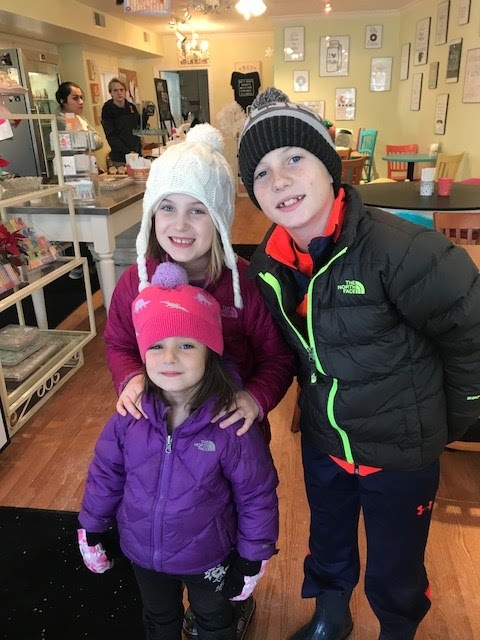 Yesterday, Peyton turned 8 and celebrated with a fun-filled day of activities. We tried to get her to go on vacation to Michigan to ski for her birthday as well as try to have a New Year's Eve party to celebrate but she wasn't having it. She wanted a birthday party at home on her actual birthday so everyone would come and focus on her not New Year's Eve! We started off the morning, opening our few presents to her and then finishing some Christmas returns so she was happy picking out little presents for herself too at every store we went into. 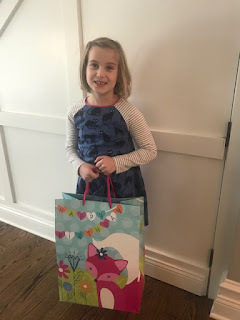 This made her day and I think I am going to continue that tradition and have a few presents for her to open but let her go shopping and pick out her own presents. She loved this and it was a highlight of her day. Then she decided she wanted to stop off at a cute little donut shop where they make these mini warm donuts. That was a delicious birthday treat that we all go to enjoy. Yum! We started her family birthday party late afternoon with an emoji theme and lots of balloons (we lost a few in the parking lot and had great fun chasing after them!). Having a birthday so close to Christmas, there wasn't much she didn't have already but she clearly enjoyed opening her presents of much needed spring clothes, an outing with her aunt/uncle/cousin, some toys and a brand new bike of her own! She had only been using hand me down bikes from Austen since she started riding an actual bike so she was thrilled that next year when she's able to ride her bike to school, she won't have to show up with a boy's bike! Happy Birthday to our little "P." She's not so little anymore! Christmas Eve was nice and low key despite the snow that came rather unexpectedly that morning. 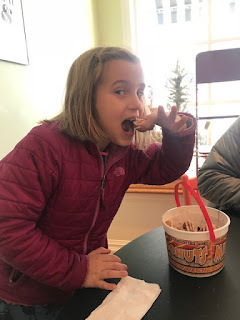 I worked out in the morning and picked up our lasagna for dinner at a nearby Italian deli while Tom and the kid fed the goats, chickens and bunny at Hailey's school and then hit the grocery store. We had an early dinner with Papa then off to 6pm mass which proved to be the service to attend as there were still empty pews available when church began (sure beats getting there an hour or so beforehand for the 4pm mass!). Austen got overheated at mass and had to step outside for a bit before Communion which actually was refreshing. Our older priest kept it quick though and we were done in just under an hour. With Austen feeling better, we drove around town to enjoy the luminaria that lined the streets of our town every Xmas Eve. After it was home for a quick dessert and bed for the kids as we knew the next day was going to be a long one for them...and it was. On Xmas Day, I woke up to my alarm at 8:10am or what I thought was 8:10am until Tom looked at his clock and declared that I must've set my alarm an hour ahead because it was only 7:10am by his clock. Okay, but I already heard the kids stirring, anxious to open presents and me already counting down the 2 1/2 hours we had left til having to leave for our first stop with presents to be opened, Sadie to be walked and fed, food to be prepared and showers and getting ready still all on the agenda. Amazingly, we got it all in and were about 5 minutes early getting out the door (it certainly helps that the kids are getting older and need less assistance from us to get ready and they can actually help now!). Even Sadie got presents and was great hanging out with us while we opened them! First stop - my side of the family where mountains of presents awaited not just the kids but the adults too (in typical Grandma Lou fashion). I think Hailey reveled in opening present after present. I think it took us a good 3 hours to get through all the presents. Racing out of there, we drove home to walk and feed Sadie, unload the presents and reload for round 3. 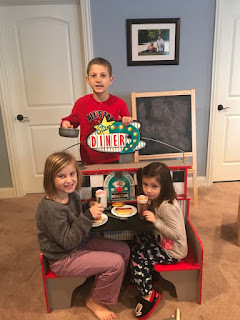 Next stop - Tom's side. We drove to the northside of the city and arrived just in time to share a delicious Xmas dinner with Tom's family. The kids reveled in seeing their older cousins and the ones who are closer in age to them (none who live close - at least anymore). And, they were ready for the many more presents they got to open too. In fact, Hailey just wanted to keep opening more and more and was very upset when a present from her list ended up as a gift for Peyton. We arrived home at 10:45pm with my kiddos finally tucked into bed at 11pm. Exhausting for sure but a good Christmas and time to spend with family. And, they could sleep in and relax all day today (which they did - never getting out of their pajamas). Play all day on the 26th! This season is probably one my most favorite times of the year. From chopping down our Xmas tree with good friends to cozy fires and counting our blessings to helping others, it's a magical time of year. 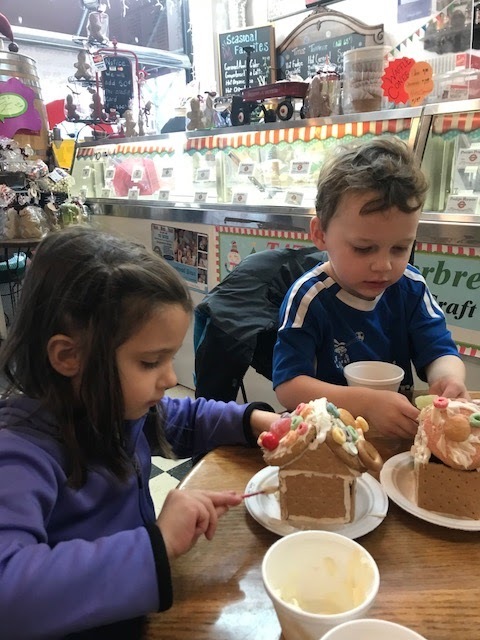 Our kids enjoy the traditions of viewing holiday lights and windows, participating in our annual village Christmas walk, sipping hot chocolate, seeing Christmas movies and sharing time with family. With almost one week left til Xmas, we've managed to squeeze in a few seasonal moments so far. Village Christmas walk. 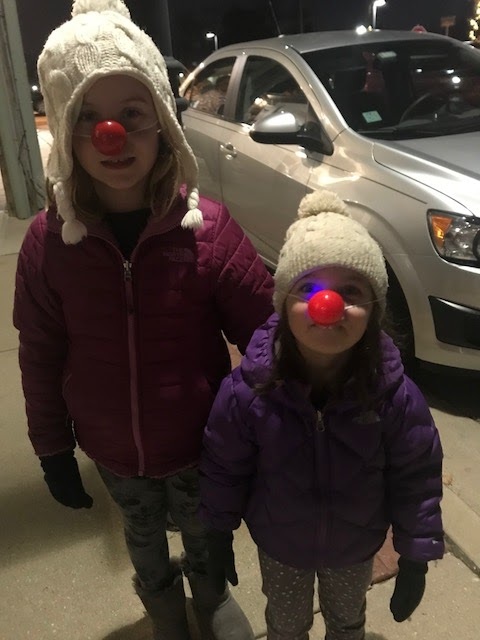 Austen was off having fun with his friends while Hailey and Peyton scored some glowing red noses at the local dentist's office to kick off the evening. A sunny but cool enough day at the local mall to walk around, see a Christmas movie and sip hot chocolate. 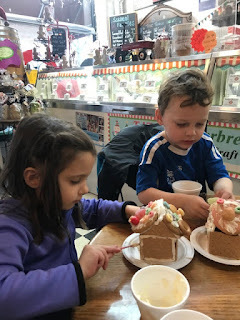 Making gingerbread houses. 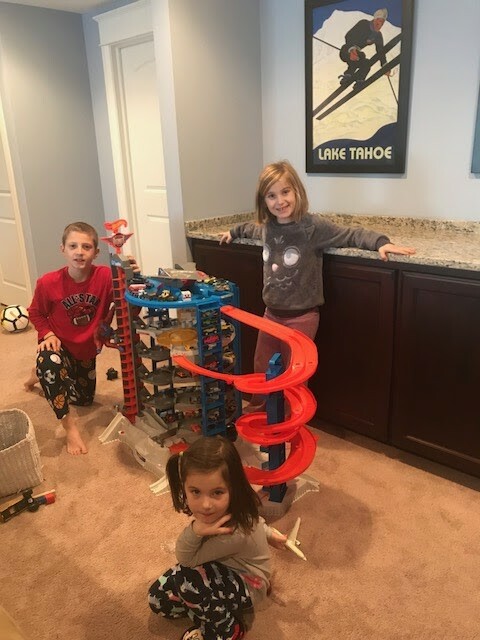 Hailey made this one with her friend Conor from soccer but it was her second one as Tom, Peyton and Hailey completed another one the week before. Finally, this evening we squeezed in the Holiday Magic light show at the Brookfield Zoo with Papa. 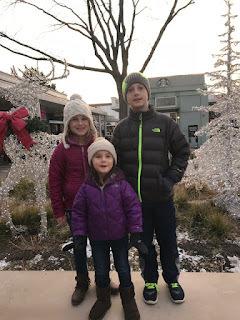 Of course we had to avoid the stuffed animal kingdom (Peyton wanted to buy a toy - surprise, surprise ) but the kids enjoyed seeing the penguins, the many Christmas lights and laughing at the smell the swamp exhibit created. 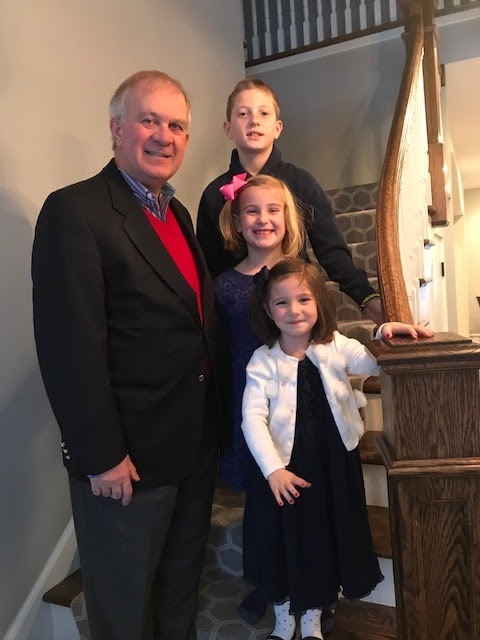 This past weekend Peyton received her second sacrament in the Catholic Church. It was her first confession or the Sacrament of Reconciliation. Oh boy, I thought she's going to be there all day since she has a lot of confessing to do! But, she told me matter of factly that her religious education teacher told them that they should confess no more than three things to keep the process moving for all the other kids and parents. Then she proceeded to tell me that she was only going to confess two things. Hmmm, I thought, I wonder which of her many sins she was going to confess because after all there's a long list - from whining, throwing temper tantrums worse than a 2 year old to being mean to her siblings to being stubborn and unhelpful - she'd definitely be there all day. Maybe I should be grateful the teacher said only to confess three or less sins! Off she went and I can say she wasn't the least bit nervous. No real angst about having to admit any wrongdoing. Hell, I don't even want to go to confession because I'd have to say how long it's been since my last confession and I really can't even remember and that would be my real angst. But not her, she's not scared of the priest but off she goes slightly annoyed that she has to spend her morning in church. According to Tom (because I was with Austen at baseball practice), once in church she paid attention more than she usually does. Then when allowed, she picks one of the many priests to embark on her first of what will probably be many confessions by her. Again, she's not nervous, sits right down and chats him up. Tom says he can't hear what she's saying but she's having a regular conversation with him. Cracking him up I'm sure. She must've sweet talked him because later she tells me he only gives her one Our Father to say. One Our Father? Are you kidding me? I can remember having to recite Our Fathers and Hail Marys til I lost track of how many I said. She also tells me she told him that she's sorry she doesn't follow all of our rules and that she is unhelpful sometimes. Sometimes. That's interesting. Now she has to go back to the priest and do another confession for lying. Ha! Oh Peyton, life would be so much duller without you! at a task he/she feels he/she can succeed at. That's a quote from Maria Montessori and one that I've known to be true since my kids started Montessori when Austen was 10 months old. We've been believers ever since. Still, with our third it was easier to help her get dressed, put on her shoes or zip her coat when we were in a hurry to get out the door than to allow her the time to do it herself. I was reminded of this recently when I attended her school parent night where the kids show you the work they do during their time at school. I was surprised that Hailey could zip her own coat! I hadn't even attempted teaching her how to do this at home but as soon as I saw her do it at school I was reminded of how much I'm not allowing her to do what she can do. Yes, it takes more time but it's going to give me more time to do other things while she's dressing herself, zipping her coat, putting on her shoes or going to the bathroom. She's capable of doing all of these things on her own (maybe with a little help to reach the faucet for hand washing) but she's very able. Also at her parent night I was impressed with how much confidence she had going around the room and showing me all the different work she can do. Watch her as she masters coffee making, uses a spoon to transfer pebbles from bowl to bowl, and tweezes corn kernels from a cob. Great hand eye coordination/fine motor skills!